A privately funded unmanned Mars mission will launch in 2018, officials with the non-profit Mars One foundation announced Tuesday. The mission will include an orbiting communications relay station, a lander equipped with a robotic arm, water generating gear, experimental thin-film solar panels and student experiments. 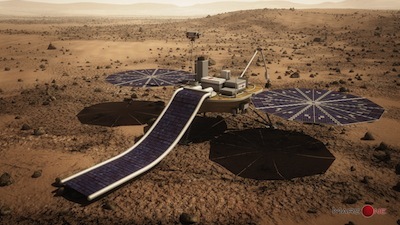 Dutch entrepreneur Bas Lansdorp, Mars One founder and CEO, told reporters the foundation has signed contracts with two major aerospace firms, Lockheed Martin and Surrey Satellite Technology, to develop mission concept studies, a first step toward eventual construction and launch. The lander will be based on the design of the 2007 Phoenix Mars lander that Lockheed Martin developed for NASA. The communications satellite -- the first such "geostationary" comsat in orbit around the red planet -- will incorporate technologies developed by Surrey and used in a variety of operational spacecraft. Lansdorp said the Lockheed Martin contract was valued at slightly more than $250,000 while the Surrey agreement came to about $60,000. Development of the actual spacecraft and the rocket, or rockets, needed to launch them will be funded primarily by sponsors and corporate donors, Lansdorp said, along with donations from the public through a crowd-funding campaign. He would not disclose internal projections for the mission's eventual cost other than to tell reporters he expected it to be less than NASA's next Mars lander, the $425 million Phoenix-derived Insight mission scheduled for launch in 2016. The unmanned Mars One technology demonstration mission is a precursor to the foundation's seemingly quixotic long-range goal of launching humans to Mars starting in 2025, assuming funding and technology hurdles can be overcome. The foundation envisions launching follow-on crews of four astronauts every two years to establish a permanent outpost on the red planet. When Mars One started taking applications for future Mars travel last spring. Lansdorp said the foundation had received more than 200,000 applications from would-be astronauts and that those selected for the next round of evaluations would be announced before the end of the year. The Mars One mission concept calls for one-way flights by volunteers who would spend the rest of their lives on the red planet. Previous estimates for the cost of a manned mission to Mars start at $100 billion. But those estimates include landers and rockets to return visiting crews to Earth, rather than a lifetime Mars colony. In the meantime, Lansdorp said, the focus is on getting the 2018 mission off the ground. Ed Sedivy, chief engineer of civil space operations at Lockheed Martin Space Systems, said company engineers and designers with experience building NASA's Mars orbiters and landers already were working on the Mars One 2018 mission concept study. The Mars One project "is the first privately funded planetary exploration mission," he said. "If you think about that, that is really, really cool. ... This is the dawn of a new era of space exploration. Private funding that supports the exploration of other planets is a concept that is really exciting." Martin Sweeting, Surrey Satellite Technology chairman, said his company has been "interested in driving the cost of exploration down and increasing the tempo of exploration and widening participation for many years." "We've been doing work in the past on projects to look at supporting sustained human habitation on the moon, for example," he said. "Mars One is really a logical step for us, and something we find exciting in trying to develop." While the 2018 mission architecture is still being assessed, Sedivy said the least expensive option would be to launch the Mars One lander and orbiter on a single rocket. But that will depend on how much separation is required between the orbiter's arrival and the lander's descent to the surface. The Mars One communications satellite will be the first martian spacecraft operating in a geostationary orbit that will permit continuous observations of the landing site. "It will function as a data relay from the surface of Mars to Earth," Lansdorp said. "It will be in a fixed location over the Mars lander, which will allow a live video feed from the surface of Mars to Earth. We expect this will bring [Mars] a lot closer to everybody on Earth. Anyone here on Earth can log into our website and see what's it like on Mars." While the comsat will be "nice to have," providing a continuous link between the lander and the public on Earth, "it's crucial for our manned missions because then we really need to have that 24/7 connection between Earth and Mars," Lansdorp said. The Phoenix-derivative lander will be equipped with a robot arm and camera that will provide a live video feed from the surface, relayed back to Earth by the Mars One communications satellite. "It will carry a weather experiment and it will demonstrate the production of liquid water on the surface of Mars," Lansdorp said. "And it will carry a power experiment that will deploy a thin film solar panel on the surface of Mars. We make use of thin film solar panels for our human mission, and this will be the demonstrator of that." A key element of the 2018 mission is participation by students around the world. Mars One plans an international contest to select an experiment designed by university students that will be launched aboard the lander. The foundation also plans to organize STEM-type challenges to involve younger students in a bid to "inspire kids into Mars exploration," Lansdorp said. "This is very important for Mars One, because with these challenges on our unmanned missions we can inspire young students even before we send humans to Mars, which will, of course, be an even bigger source of inspiration on Earth."